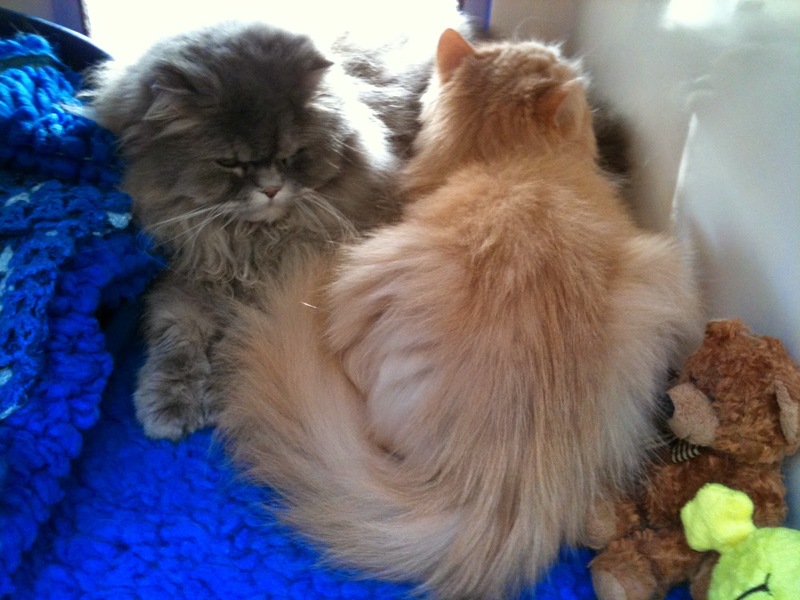 This is Blue and Peaches the very first time was met them at the Cats Protection National Cat Centre in Haywards Heath. We had gone to view kittens but did a last minute swerve to the pen next door where we were told Blue and Peaches were 12 and 14 respectively. When we decided to adopt two older cats the deal was to give them a peaceful retirement knowing we would not have them as long as kittens. We were resolved from the start that when their time came there would be no heroic measures to prolong their lives unnecessarily. As long as they were happy and comfortable it was quality of life that counted. When we first took them home they hid in dark corners and cupboards for the best part of a week. It was another week before we let them out into the garden. The picture below is Peaches' first exploration of the garden. It has to be said the she was never much of a one for going out. She could work the cat flap but, like most cats, preferred her humans to open the door for her. Every cat is different. Peaches was never a lap cat. She was incredibly timid at first and we are quite convinced she had been mistreated in a previous life; for the first couple of years she flinched when you put your hand out to stroke her and would scurry away. All our friends remarked how much less timid she became as she relaxed and got used to her safe new home. We learned to approach her slowly from the front so as to not startle her and let her sniff your hand to get used to you. Although she was not overtly friendly the moment we walked into the room she would start purring, a really deep rumble, like a furry diesel engine. The closest she ever came to us voluntarily was sitting on the back of the sofa however she was very happy to be picked up. Being an elderly cat she didn't hunt, she didn't jump into cardboard boxes, she treated cat toys with indifference. What she did do was what cats do best - sleep and eat. What she also did not do was meow, she was a completely silent cat. Well almost: once I accidentally trod on her tail and she yelped; once in the middle of the night she made a wailing noise (I suspect intruder fox). But that was it - in five years, never a squawk or shout or a chirrup. 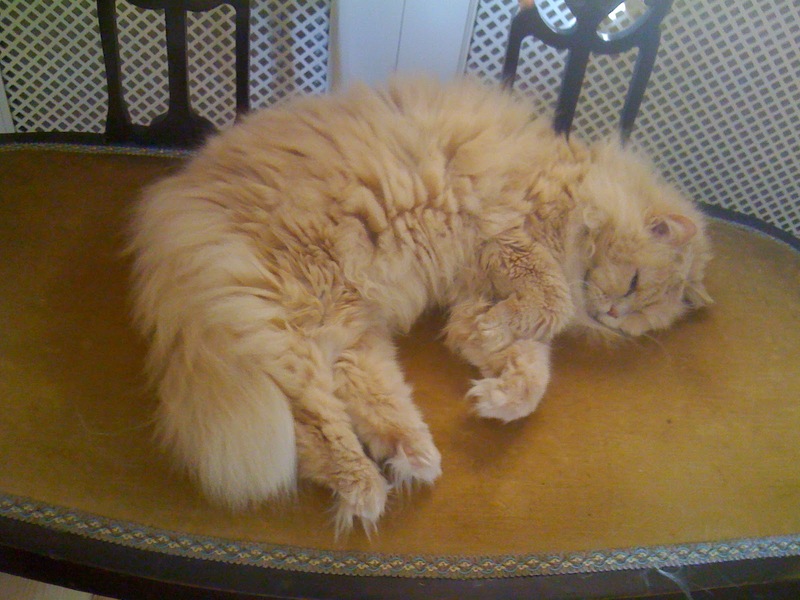 Cats have favourite sleeping places: back of the sofa, under the breakfast table, on the dining room chairs and of course on the stairs where Peaches was a regular health and safety hazard. Occasionally Peaches would get creative. She mostly ignored her pillow but a nice warm basket of laundry made a more than acceptable alternative. 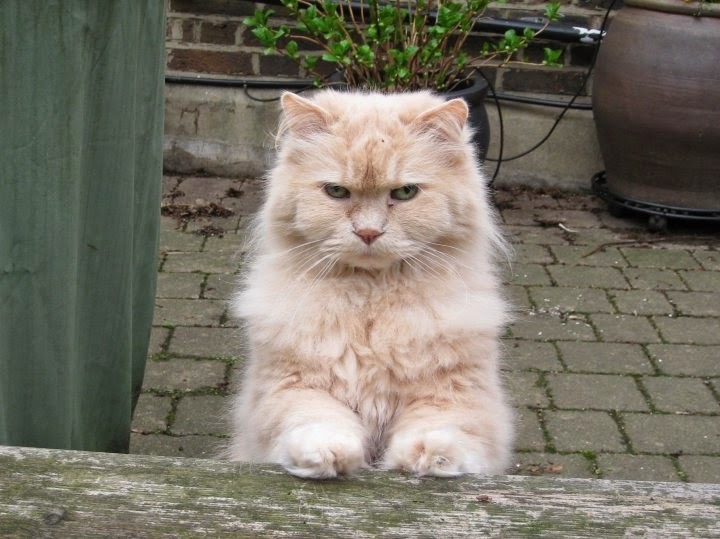 Classic cat! Peaches was hard to photograph because she always looked down. She never looked at the camera, always at the floor. 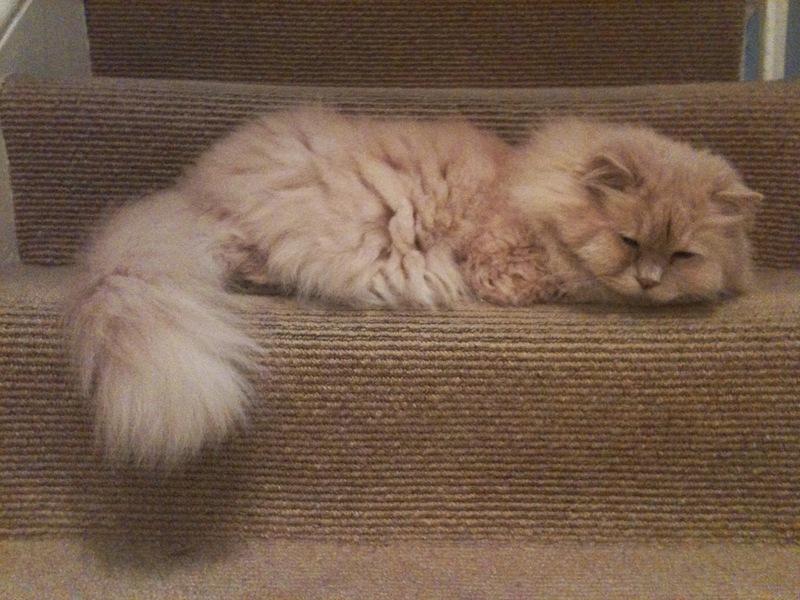 This is one of my all time favourite pictures of Peaches. Not staged, we had set the table for supper and up she jumped as if to say "Where's my food?" The end, when it came, was not too protracted. An infection lead to a several night stay at the animal hospital and further tests which revealed cancer of the liver (and possibly lungs). She had lost weight, was not eating and was having to be fed by tube. We brought her home for one night and Mary, having been away on business, was able to give Peaches one last cuddle. The decision to have her put to sleep was clear and unanimous. We woke the duty vet up early the next morning and drove her straight over. We both were present and stroking her at the end. We had her cremated and still have her ashes which we will plant under the rose where Cleo's ashes were also buried. I feel happy that we have kept our side of the bargain with Peaches and she in return provided us with her own unique feline company for five years and five days.